There's still snow on the ground...but nonetheless, the birds are back, and we're all very, very happy about that. 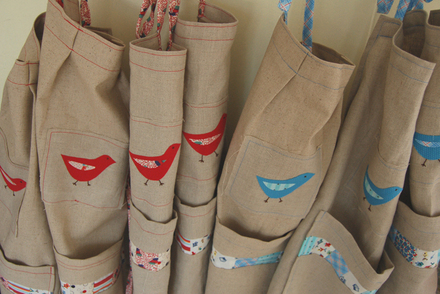 There's a new flock of bird aprons around too! A whole big flock of them have just been added to the Etsy shop this morning. You'll find child and adult sizes. 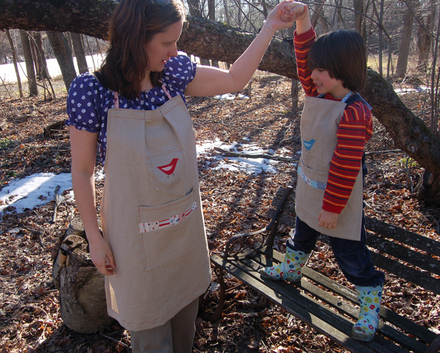 These will be the last of the bird aprons, so if you missed out last time, I hope today will be your chance! I won't be making these again. 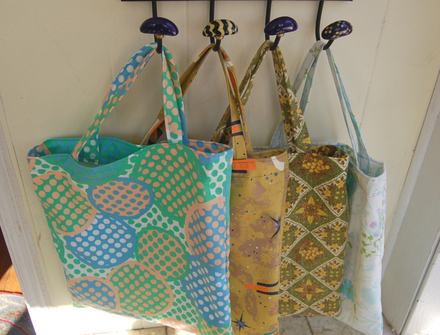 You'll find just a few market totes in the shop as well. Remember, these are made with all vintage fabrics. And I seriously want to keep them all. But I won't, I promise. Tomorrow I'll show you some things I've made for my favorite local shop. It's been a flurry of sewing-to-sell these past few weeks, and it's been quite fun. I actually enjoy making 'sets' of things, and I've enjoyed keeping the shop updated regularly this year. Of course, it's made all the more fun with your positive feedback and support by buying my wares, so Thank You for that! But now I think I'm going to ease up on the sewing-to-sell, and the Etsy updates, and slide into more of a monthly update. I'm feeling my energy and focus pulled in some other directions right now. Some writing projects in the works. A bit of necessity sewing (these kids - who said they could keep growing?). And some gardening and spring yard readiness outside. Yes, it's definitely time to shift some energy outside. The birds are back, after all. Thanks, today and always, for your support for what I do. It's so very much appreciated.